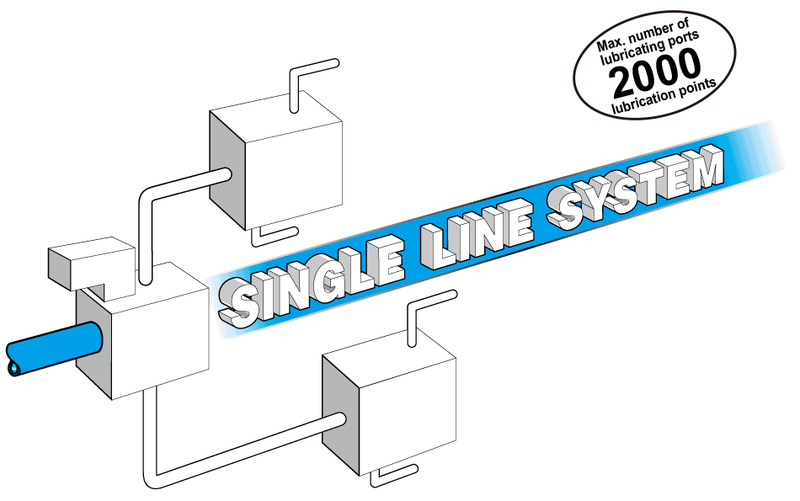 Single Line Centralized Lubricating System | Overview | Daikin Lubrication Products & Engineering Co., Ltd. In recent years, large-scale manufacturing equipment and facilities such as steel manufacturing facilities are steadily growing in complexity and size. These facilities have an enormous number of lubrication points, and required lubrication conditions are becoming increasingly severe under harsh operating conditions such as high speed, high loads and extended operation. Single line centralized lubricating systems are widely adopted as the most efficient and reliable centralized lubricating systems as they automatically and reliably supply appropriate lubricating amounts even under severe environments such as these. This lubricating system can accommodate small- to large-size equipment and facilities connected to a single pump and progressive operating system distributing valves by a single piping line. Lubrication can be performed accurately by planning the lubricating amount for each individual bearing in advance. The appropriate lubricating amount can be set by selecting the distributing valve element. Once set, the lubricating amount stays the same even if environmental factors (bearing, resistance, temperature) change. Operation is assured by the progress operation system. The feed pipe is a single pipe, which allows piping to narrow locations. With this system, the discharge supply line is connected to the 1st stage piston, and passages to the other pistons are blocked by respective pistons upstream. 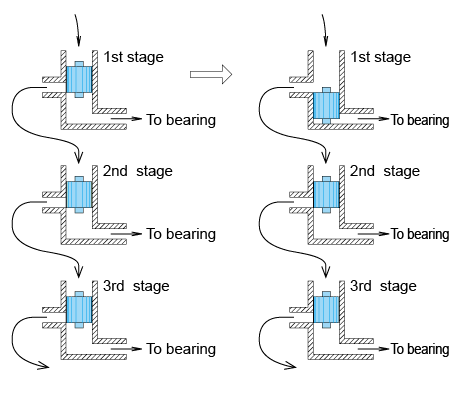 Accordingly, when the 1st stage piston is pushed down by the lubricant that has been fed from the discharge supply line to end lubrication, the passage to the 2nd stage piston opens to perform lubrication. When lubrication ends, the passage to the 3rd stage piston opens to perform lubrication. As this system involves progressively feeding grease in this way, bearings that have a considerably different lubrication resistance can be reliably lubricated, and lubrication can be checked easily at one location.